Pick up part pages of PDF file to page-flip book? Before a flipbook completed, you would like to eliminate some parts of the PDF file which you needn’t. If the flipbook creator just code with all the pages, it can hardly be a considerate and a popular tool for people who have the requirement. Actually, sometimes we just need process part of the PDF file. Anyway, other part is useless for the purpose of popularizing or sharing. FlipBook Creator for MAC definitely makes it achievable that you select page range for further converting. Step1: Start FlipBook Creator for MAC, and then click the top icon of Import PDF. 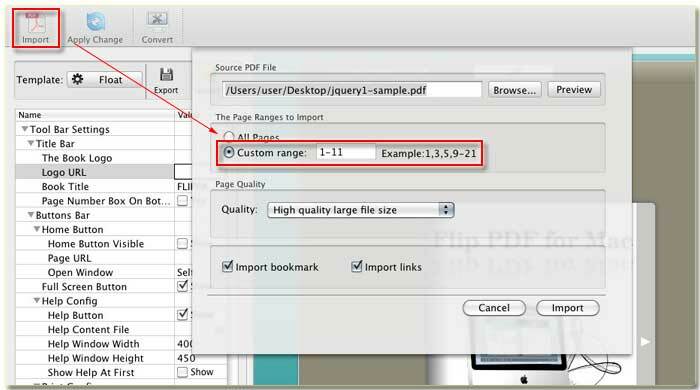 Step2: As the illustration shown, you would see the form of page range, you should enter the page number or range which you require in the form. Note: the format of the defining page range for example you only want to import the first, third, ninth, fifth and seventeenth to twenty pages of the PDF file, and then you should enter the string 1, 3, 9, 15, 17-20 in the page range form.